​April 2 and May 14, 2019. Everyone is welcome as a participant or as a spectator. You don't have to sign up or attend every month. Drop ins are encouraged. ART DECO design, like Modern Quilting, is characterized by its use of bold, primary and secondary colors – red, black, green, orange, yellow, blue, white. In Florida, Art Deco buildings still abound using “beachy” colors – salmon, cream, pale greens and blues, gray – the softer side of primary colors if you will. However, please feel free to use whatever color combination you choose. Will you take on this easy challenge? The ‘Wonky Chickens’ are easy, but challenge your creativity. See the photo from Gwen Marston’s book, Liberated Quiltmaking II, available at the Mission Library. Bring your ‘Wonky Chicken’ to the January meeting to share and talk about how you approached the challenge and what you learned. There are very few rules and they only apply if you wish to donate you block for a NICU donation quilt. You may like your piece so much that you decide it’s a ‘keeper’. Instructions: Make a Wonky Chicken block with a finished size that is divisible by 3 inches and no larger than 18 inches finished. Use ‘low value’ fabrics in the background. Anything else is up to you, the designer. A close look at the photo will show some 3D options. The following links have instructions to make ‘Wonky Stars’ but there are no rules. Experiment and have FUN! Thanks to Laurie for closing out our season with her informative presentation on machine quilting -- more than you can imagine about needles, threads, batting, gloves, posture. We are fortunate to have this local expert in our midst! Since we ran out of time, the conclusion of this session will take place at our first meeting in the fall: September 11. In case you missed it, here is the link to the Schmetz Color Code Chart.﻿ Lots of other good reading on this website. 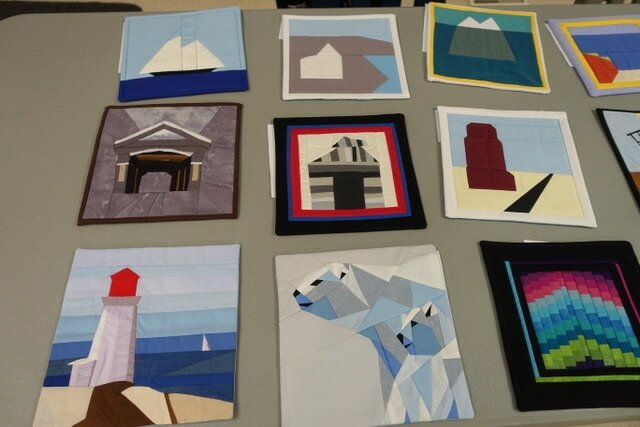 Several of our members tried their hands at building an illusion quilt under Barb's guidance while others looked at ways of using layer cakes to make donation quilts. Here are the instructions for those who still want to give it a try. Please note: Printed instructions will not be supplied at the class. Participants can access them online or bring their own copy for the tutorial. Extra fabric strips will be available. Alternate grid work is a modern quilting design element that is used frequently by modern quilters. It is often one of the easiest design elements to experiment and explore modern quilt making with. Modern quilters often “break the grid”. Alternate grid work is a tool to help showcase modern quilting design fundamentals such as negative space, no borders, minimalism, asymmetry, modern traditionalism and exaggerated scale. Alternate grid work in modern quilt making refers to quilts that don’t follow the traditional block format of many quilts. The majority (but not all) of traditional quilt styles follow a predictable grid structure. It’s important to note that some modern quilts DO follow traditional quilt grid work and some traditional quilts do NOT follow traditional quilt grid work. The Straight Set – columns and rows of repeating blocks. Medallion – a central focus feature with design elements bordering outward. Traditional grids can be adapted or altered beyond the normal repeating columns and rows. Shifting the on point angle to an atypical degree. Modular Grids are the basis for a vast majority of quilt design. You can use a modular grid, but don’t follow strict columns and rows. Using scale is a great way to use a modular grid in an alternate way. Adding negative space is another way to use the modular grid in an alternate way. Variable Framing uses the modular grid, but floats blocks in negative space. The underlying column and row format is there, but utilizes negative space to make it modern. Offset or Misaligned Grids shift the rows and columns to offset blocks. Paneling does not follow a modular grid structure and disguises any underlying grid. Click below for the notes from this session. Barb led us through a lively discussion of new names for the group and ideas for future meetings, and some of us signed on to create a few more colour blocks (see below** for instructions) which we will lay out at the April meeting. We also discussed mounting the provincial/territorial blocks at the quilt show and will experiment with 3M sticky mounts. The thinking is that we might mount them deliberately off-kilter for a mod look and to disguise any irregularities in size. After a discussion of a new name for the group, we enjoyed a round table "show and guess" of the provincial and territorial blocks finished so far. (Note: the deadline for these blocks is the end of May, and Barb has lots of solid colour fabric available if you need some.) Sue showed us the finished quilt from the November/January design tutorial -- completed with the design decisions made by the class. Stunning! Remember our monochromatic blocks? Joan still has 4 red, 3 blue, 2 orange and 1 green block and would like more to be able to finish a small quilt for the CQA donation project. She's aiming for at least 16, or even 25. If you have time, please consider making a couple more. **Here again are the directions for the improvised monochromatic blocks: 10 1/2" square unfinished, backed with low loft (80/20) batting (NO backing), quilted in the complementary colour. Use at least 3 fabrics in your colour family -- and you may include white. ** To complete a 16 block quilt we would need: 1 more blue, 2 more orange and 3 more green. 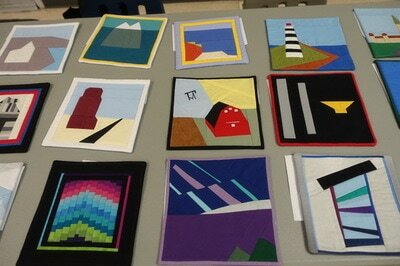 To compete a 25 block quilt we would need: 1 more red, 2 more blue, 3 more orange, 4 more green, and 5 yellow blocks. Let Joan know what you are planning to do! More information about our Canada 150 project has been posted on the Quilt Show Information for Members Only page. A beautiful array of rainbow blocks were handed in. If you are not finished your blocks yet, please get them to Joan before Christmas as she will be assembling two quilt tops. Needed: volunteers to sandwich, quilt and bind these two modern donation quilts. 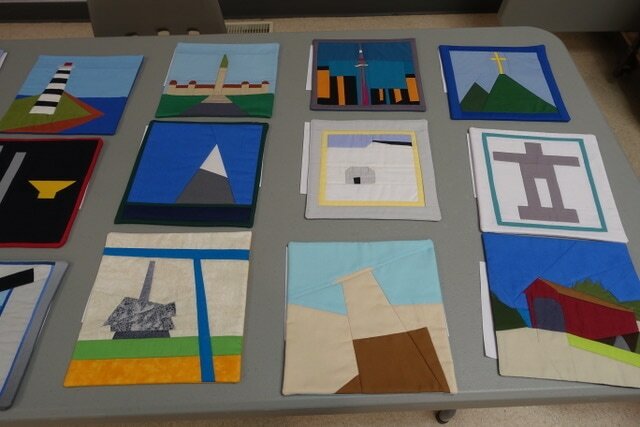 We also discussed our project for the Canada 150 quilt show: modern architectural blocks (8 1/2" x 8 1/2") representing our provinces and territories. Sign up for the province/territory of your choice. We're aiming to have these finished by March or April. ​More on this in the new year. ​*Next month's challenge: create 2 improvised monochromatic blocks, each 10 1/2" square, unfinished. Back each block with low loft (80/20) batting (NO backing) and quilt in the complementary colour. We numbered off: 1=orange, 2=yellow, 3=green, 4=blue, 5=red. (If you weren't there, see Joan about your colour choice.) Use at least 3 fabrics in your colour family -- and you may include white. 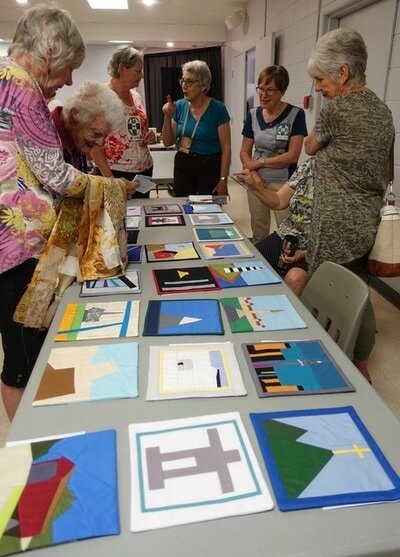 After a brief Show and Tell of the pieces some of us created at the recent Lyn Longair workshop, Barb shared with us her own exploration of modern quilting through a Power Point presentation and a display of her own modern quilts. A copy of her presentation will be posted on the Members Only page soon, but in the meantime follow some of our Modern Quilting Links. Here is the response to last month's "Stack" challenge. Stunning! ( Click on images to enlarge; use side arrows to navigate. )​ See the Show and Tell page for more pictures. Here are the beautiful results from Sue's challenge to use negative space to full advantage. The March challenge is to create a STACK. Don't feel like you have to put every modern style into one quilt. Focus on what you like. Play around with simple shapes and repeat the element throughout the quilt. Less is usually more when it comes to modern quilting. Create a small modern piece (approximately 14" x 18", or placemat size) with lots of negative space, sandwich it, and fill the negative space with some interesting and intense machine quilting. Here are a few pictures from the meeting and of last month's challenge to reinvent a traditional block in modern style/colours. ​Click on images to enlarge; use side arrows to navigate. Photo Credit: Marian Grimwood. We chose a name, we collected more than 20 slabs (the November challenge) for donation quilts, and we were inspired by Francine's trunk show. Francine started her quilting journey with modern fabrics and modern blocks. The challenge for the rest of us is to use the fabric we already have in modern ways, hence this challenge for January: use the fabric you have to create a modern block (any size) by altering a traditional pattern and/or adding a solid colour as a negative space. Plans are in the works for a Modern Quilting Workshop in April. Watch the Workshops page for updates. Our first meeting on October 27 was a HUGE success. More than 40 dedicated and wannabe modern quilters turned up brimming with enthusiasm for Modern Quilting. Lots of ideas flowed from the group, and we held a quick planning meeting on November 10 to set up an agenda for the rest of the year based on the suggestions from the group. Several members took up the October Churn Dash redesign challenge -- and we forgot to take pictures! (Please bring them along next time for a photo shoot.) People want challenges so we came up with a new challenge for November. Construct a 13" x 15" (unfinished) SLAB (the Modern word for block) which will eventually become part of a donation quilt. The Donation Committee will provide the fabric at the next couple of meetings, and we will provide some guidance in creating the SLAB. You can find lots of information by Googling "Slab Quilts" or go straight to this address for some background and instruction: http://naptimequilter.blogspot.ca Your SLAB can be monochromatic, or feel free to mix it up. And you can start with a white patch -- or not. Participation optional, but this looks like a lot of fun!! It's also a great learning experience! !